When it launched, WiiWare signalled a shift in Nintendo’s attitude toward developers and gamers. After Dr. Mario and My Pokémon Ranch hinted that it was really just another outlet for them to spawn pedestrian versions of their tremendously popular franchises, many gamers lost hope in Nintendo's plans for WiiWare. Then, suddenly, Art Style: Orbient appeared as if out of nowhere and although it was a remake of a Japan-only GBA release, it rejuvenated enthusiasm in the service by offering a glimpse into Nintendo’s intent to offer elegant gameplay at a reasonable price. 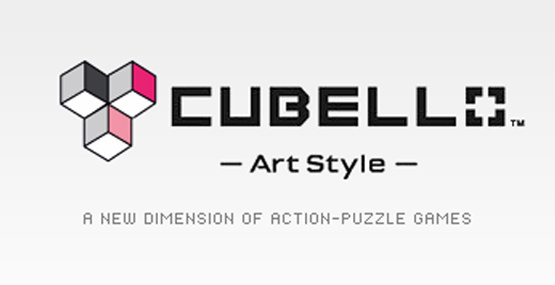 With Art Style: Cubello they’ve upped the ante with a completely original 3D puzzle game that is unlike anything on WiiWare or practically anywhere else. 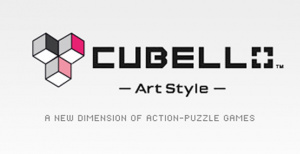 Cubello’s premise is a deceptively simple, three-dimensional take on classic puzzle gameplay. Each puzzle, or stage, is a structure made up of a number of cubes in various colours. The goal is to launch coloured cubes from your magazine (which holds up to ten) at the structure to match four or more cubes, which causes them to disappear and more cubes to be added to the magazine. 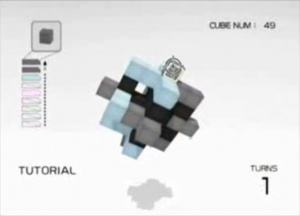 As cubes vanish they cause any detached cubes to fall toward the core, effectively changing the structure and potentially triggering combos. The stage is finished when all that’s left is the core; however, run out of cubes in your magazine and you’ll fail. Compounding this simplistic design are equally straightforward controls that yield enthralling challenges. While the basic controls consist entirely of highlighting an area with the pointer and pressing A or B to place a cube in that spot, Cubello is not as easy as it may sound. 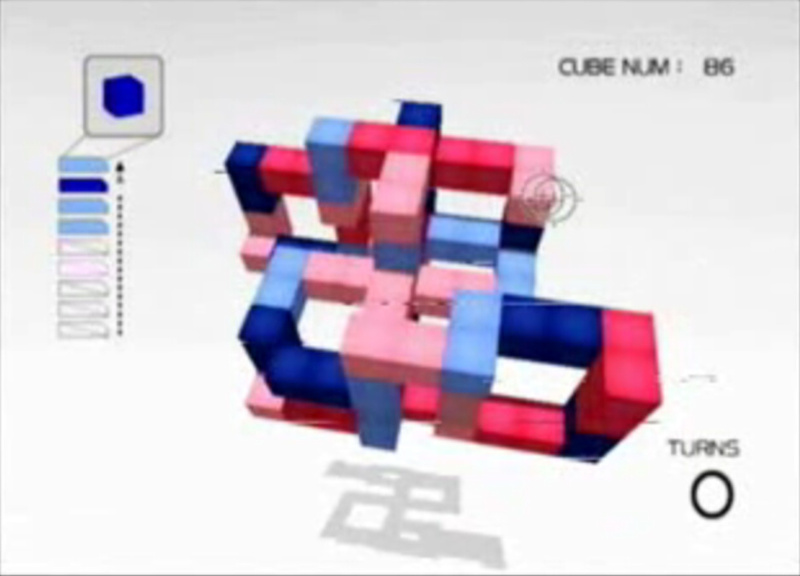 Each puzzle is in perpetual motion and placing a cube causes the structure to rotate in the opposite direction, leaving the player balancing careful thinking and patience with a quick-trigger and steady hands. The structure also moves steadily toward the screen until it collides and causes a few cubes to be removed from the magazine. Likewise, the closer it gets, the smaller the window is for launching cubes. To keep it at bay you must continually launch and match cubes, which will knock the structure back a bit. Topping things off is a hint of luck in the form of randomly activated bonus rounds. 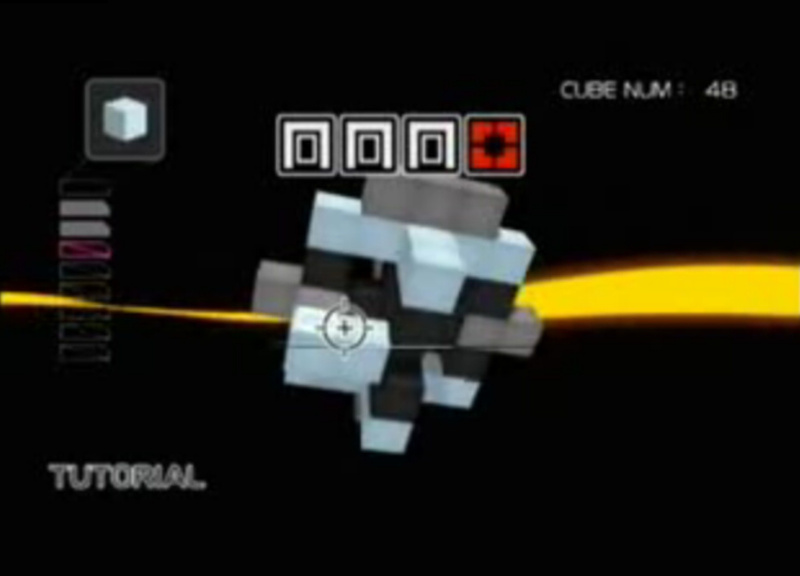 Each matched series of cubes triggers a corresponding number of slots. Matching four slots activates either a normal (unlimited number of a specific colour) or super (unlimited number of all colours) bonus for a short period of time, leading to a frantic race to launch as many cubes in the proper places as possible to make some potentially serious headway -- conversely, careless placement will only add further clutter. This adds a welcome dynamic to the otherwise straightforward gameplay, but also means that high scores are occasionally subject to lucky breaks rather than effective, efficient thinking. All told, Cubello offers countless hours of gameplay over two distinct modes. There are over 35 widely varied stages divided into six levels with each subsequent level introducing more colours than the last (the first has three while the last has eight). Beating a stage unlocks the next level as well as more stages in the current level, meaning the game thankfully never requires you to play a specific level over and over again to advance. However, the goal is to not simply complete each stage but to do so in the fewest number of turns and in the shortest time possible. 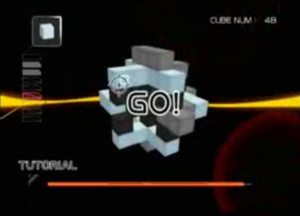 Additionally, there is an unlockable ‘endless’ mode that challenges the player to complete successive randomly generated puzzles until getting stumped. Here high scores are tallied on a point system and then recorded on a local leaderboard. 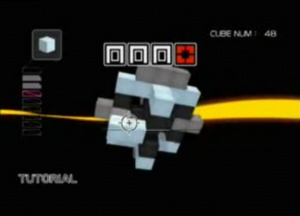 Points are scored for matching cubes, triggering combos, and for finishing a puzzle. In a nutshell, Cubello has plenty of challenges for even the strongest intellect. Finally, Cubello’s presentation is based around modest aural and visual design that is entirely adequate and mostly pleasant. 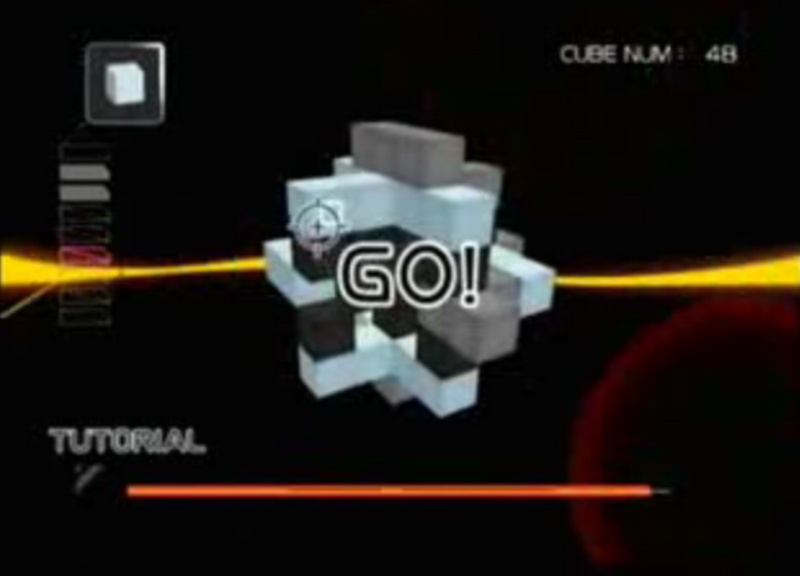 The cubes and colours are all easy to identify due to the minimalist graphics and the music changes from strictly ambient to upbeat based on your performance. There are, however, a few occasionally grating sounds and a mildly annoying voice that announces the launch of every cube in a computerized accent. The result is a game that maintains a proper, if unimpressive graphical and audio fidelity to achieve a desirable block size. It certainly could look and sound better, but as with any WiiWare game it’s a trade-off between size and style. Despite its basic presentation and superficially simplistic gameplay, Cubello is the kind of game that delivers an engrossing experience every time you pick it up. A compelling blend of concepts makes for progressive gameplay that constantly evolves into fresh challenges even when repeatedly replaying the same stages; inspiring proclamations of “just one more level” well after you planned to put down the Wii Remote. That's the trademark of quality game design and a testament to Cubello’s value for a mere 600 points and 47 blocks. It’s one of the best puzzlers on WiiWare and a must have for any fan of the genre. Just be prepared for each play session to balloon into an extended diversion. Great start to the Art Style Series! Looks like the Art Style series will be a nice addition to WiiWare. "Oh no not another puzzle game!" Great review Alex, I can't wait for this and Orbient to hit EU! Great review Alex. I just couldn't get into it. Not my thing at all. Good conclusion to the review. That's the same thing that happened to me. I was just going to clear a couple Cubellos before work, and I ended up not being able to peel myself away from the screen until I had finished all 6 stages from levels 1-3. Fun puzzler. Try playing with the Zapper! I was expecting the robotic voice to complete drive the review score down. I am pleased it doesn't dsirtract too much from the fun gameplay the title looks (and sounds...no not that sound) to offer. This looks pretty good. Whenever I can get some points (who knows when that will be), I'm getting this and WoG. I was planning on getting all of the rest of the MM9 DLC, but I'll just get the extra level so I can afford this. I'm gonna buy the whole Art Style series! I thought it was going to get at least a 7 so I'm glad to see the 8. I love this game! It's one of my favorite wiiware games already and I highly recommend it if you like puzzlers! It's extremely addicting! So is this game sort of like a 3D Bust-a-Move? This is one freakin' rock-solid solo puzzler. Yet another incredibly pleasant Wiiware, Art Style surprise that manages to be a much deeper experience than the surface lets on. "Just one more level" sums this game up perfectly, as Alex stated in his review; I can't put my Wiimote down. The robot voice never gets annoying, the simplicity of the gameplay really opens the longevity of the experience wide open and keeps the player striving for faster times and fewer block usage, the music has a nice, ambient drive to it and the overall atmosphere of the game is just... enjoyable. It's gaming at its most basic and most engaging. I didn't want to have that many puzzlers on my wii, but now I have Groovin' Blocks, Plattchen (and yes, I like it), Toki tori, Pokemon Puzzle League, and I really want Cubello and Madstone, not to mention World of Goo, which I don't think I'll be buying soon due to a serious lack of wiipoints; I really have to admit that there's been more enjoyable puzzle game releases than what I expected, like this Cubello game, it looks quite charming, a very good shot for Nintendo. Now I don't care how many puzzlers I end up having, while they're fun (but now I'm gonna need more money ). I really wish these Art Style games were 500 so I could get one with World of Goo. Oh well, must buy multiple cards. Great review. Gonna pick this up soon. I loved Orbient. Dang! slow down. so many games. I need more memory and some time to catch up on work. I didn't expect wiiware to get so good so fast. This reminds me (visually) a little of the old "Block out" arcade thing. I want orbient, too. Now I'm really ready to kill my mail in rentals and save it all for wiiware. This looks good, defintley consider if i have any spare points left over. This game looks great, i wish we would get it tomorrow. but it's VC week. surely there are enough wiiware games they they don't need to alternate anymore. i would by this , orbient and world of goo tomorrow if they came out. I PLAYED BOTH THE ART STYLE GAMES AND THEY'RE RUBBISH! No wonder they werent heard of before they came out! Also, Not that Orbient is good, but it was better than this. Considering that strong bad is worse than cubello and the same as Orbient is just ridiculous! People, dont buy these games you'll be easily disappointed! Some of your reviews I agree with, but I had to put my foot down on this, sorry. thanks for the review, the nintendo channel video was rather confusing. I'm having a great time with orbient and may pick this one up at some point. I must admit that I really like the look of this one, and so can't wait for a possible UK release. Still not too bothered with Orbient though, and think the series should be 500 points rather than 600, due to the games' depth. I know not everyone will agree with all our reviews because each person has different tastes and preferences. The Art Style games, in particular, demand a certain appreciation for profoundly simple puzzle games. That is, they are both very simple games on the surface, but gradually reveal their depth as you advance (maybe a more efficient way of saying it is 'easy to learn, tough to master'). Both games, I feel, offer a ton of value for the price and block size if you can appreciate their underlying complexities and extremely elegant design. If you don't agree, there is nothing I can say other than "to each his or her own." So, I'm sorry if anyone feels our reviews are "wrong" as none of us wants to mislead anyone--especially our readers. Understand that we call these as we see them. If I was the only one on the planet that liked Cubello, I'd still give it an 8 and praise its accomplishments. That's all I can do. Hopefully you can always appreciate our honesty, if not our judgement. Kinda like MaBoShi then? I didn't even realise there were boss battles on bar until the other day! If you were talking about me being bad, then you're wrong. I think reviewers would like some feedback on their review, so I was just giving back my feedback. Usually, I wouldnt bother, but seeing that no-one thinks its bad, I decided to show my point of view on it. Also, Yeah, MaBoShi, is pretty much the same, I would buy that game over this though, because it offers more than this does not that I like that game either. Again, yeah, I was just giving my feedback on the review on this game. It might just be I'm not into these types of games perhaps, so sorry. The only reason I gave my feedback was because I noticed no-one had said anything bad about it, and in my experience, that makes the game good, if someone was reading this and everyone thought this game must be good and read that everyone liked it, they'd probably get it, so I'm just helping them to think if they like this type of game before buying. oh yeah i'm aware at this stage world of goo is not getting a wiiware release. but i was saying that i would get it if released. Honestly i'm hoping they will change thier minds and release it on wiiware. if not i'll get it on steam, i hope that this message comes across because i've notice i'm not the only person thinking that way. Yet another game to add to my wishlist. Haha, nice to see people "putting their foot down" about their subjective opinion. I really enjoy both of the Art Style games, and Cubello has already sapped a ridiculous amount of my time. You can seriously zone out and plays this for hours at a time. I haven't even tried the Endless Mode yet. @LAA: You made it sound like you had to point out that Alex was "wrong." That's why people are reacting the way they are. Hell, I m interested. Small price, small blocks, so definitely worth a try. Anyway, I wasn't at all offended that you disagreed with me or anything, it's just that you stated I got the review "all wrong" and I felt compelled to respond. However, if you still believe that I'd like to hear why (other than the game just not being for you, of course). I think these Art Style games are going to come with mixed opinions. But so far they seem to be quite popular with gamers. I remember the bit Generation games and how mixed the reviews of them were. They certainly don't appeal to everyone, but I think many find their minimalist approach a bit refreshing. Not to mention their cheaper price and smaller block size. Finally a descent Wiiware game that I can enjoy without having the same old "should I delete a, b, or c, to make room for game d" problem like I do for every other Wiiware. This is a must-download title for when I go home from school, along with Rubik's World when it comes out in November. @ 33. LAA - Since these games are published by Nintendo it is an automatic download for me. The art style series looks pretty interesting. And I wish every game has a low block count like cubello. Boy do I love this game. The robot voice isn't annoying for me at all. In fact, it adds to the game. Does this game have an option to turn the robot voice off? This game is so much fun to play. @Versus22: Thanks, I agree . @Ferret75: Unfortunately there is no way to turn off the voice, but it's really only annoying when you aren't the one playing the game... If that makes sense? This game is seriously fun for a 6 dollar game. I'll throw my hat in with many of you in regards to the robot voice though. It's not bad when it's just playing through my TV speakers though. I want this game so bad. NEED WII POINTS NOW!!! @ absen and the deleted text: "As simple as it is, it took ages for me to understand what the actual point was." It took ages to understand? Did we play the same game? And maybe you should read some reviews before you buy games . @ absen's deleted "Review": The first paragraph says nothing about the game, the third paragraph says nothing about the game, and even the second paragraph says next to nothing about the game, so the whole comment is ridiculous. @ absen's deleted text: Your whole comment is still very childish and provoking. "The game doesn't even make creative use of the Wii controller; you might as well be using a mouse or standard controller." A standard controller? How should that function? Another point: Do you know Tetris? It is normal in a Puzzle-game that (with the time) the action gets faster, and also the game mechanics of Tetris isn't much more different than the game mechanics of Cubello, so i don't understand why you complain about the gameplay. This is a puzzle game, and if you play it right you have fun, but i think you don't even try to understand Cubello. "Basically you could just sit there and mash the A button over and over again and sometimes win and sometimes not." This is also so ridiculous that it proves that you don't play the game. there. i edited down to simple and clear. that better for you? just because you don't agree with someone and are a fanboy does not mean it's okay to sit and flame people. wtf? did your dad code the game or something? I just want to make clear that your negative points are not that negative because either your explanation is weird or it is the intention of the game or the genre to do so. And to say that your comment was childish and provoking is rather an "attack" to your text than to your person. i didn't have fun playing it. i don't like it, and i found it to be boring. i don't care for the music either and the announcer is annoying. also it is sometimes hard to tell exactly which color a block is. it also makes you sit through the credits unless you just shut off your wii, this is also accompanied with annoying music. I like this game. There's just one thing though. There's no option to change the colour schemes for people like me who are colour-blind. So it gets a 7 from me. It gets a 9 based on gameplay but that fault brings it down for me. If this had a co-op option / scoring, then there would be a lot more life in it, but for a single player game, it's not that bad. I just downloaded this game and it just feels a little random. Where is the actual skill or technique in this game because it feels like all I have to do is keep shooting until ll the blocks are gone? I waited a long time to get this one, but I had 600 points burning a hole in my pocket. I chose Cubello thanks to your review, and I love it. I was worried after watching the videos that I would hate the computerized voice, but it doesn't bother me at all while I am playing. Now my wife, on the other hand, will probrably get tired of it pretty quickly.